How People With Asperger's Think - Part II | Kenneth Roberson, Ph.D.
People with Asperger’s tend to be rigid and have narrow perspectives. They also ignore emotions as a source of understanding the world. In the first article, I explained Concreteness and Sensory Thinking, both of which occur almost always in people with Asperger’s. Here, I examine Attention and Emotional Thinking. These are also typical ways people with Asperger’s use their minds to consider information, form opinions, reason about something and make decisions. Together, these four types of thinking are characteristic of Asperger’s and create a picture, of sorts, as to the primary ways this condition affects the thinking process. Two crucial considerations to begin with: First, Asperger’s is a widely varied, complex, and irregular syndrome, and the boundaries separating it from other conditions are often hard to detect. When I speak of the thought processes of adults with Asperger’s I am doing so in general terms. Some with Asperger’s may not think exactly as I describe it while others fit this description perfectly. It bears reminding that no two people with Asperger’s are identical. Second, there is one main fact that must be understood in order to fully grasp the complexity of Asperger’s. Unlike most people, those with Asperger’s do not have the innate ability to notice and comprehend the emotional states of others. Lacking such an ability to recognize, even be interested in, how other people think and feel leads to the characteristics and thought processes that are unique to Asperger’s. It is well established that people with Asperger’s have difficulty planning and organizing their actions, choosing goals, monitoring progress toward their goals and recognizing when their goals have been reached. It is also hard for them to take the perspective of others, understand social rules and conventions and interpret what it means when people behave the way they do. This is all due to their fundamental inability to relate themselves to others and their consequent aloneness. More narrowly, it is typical of people with Asperger’s to get stuck in one way of thinking. They tend to address a problem in a certain way that makes sense to them and have trouble shifting to another strategy when their way doesn’t work. At times, they don’t notice or care, that they are stuck in a problem-solving approach that isn’t working. Flexibility is compromised. Discriminating major tasks from minor ones and allocating time and energy accordingly is challenging, a problem amplified by a lack of self-awareness and insight about their own problem-solving difficulties. Additionally, since they are not naturally focused on people and engaged with them they tend to be absorbed in their own thoughts and actions. Turning their attention back to the world of people means a constant shift in attention from their own inner world to the outer world, a difficult process itself. I use the word Attention with respect to this style of thinking because the overall effect of what I am describing is difficulty taking notice of someone or something, carefully thinking about, listening to, and interacting with someone, concentrating on information and taking action towards a goal. Because of impaired social understanding, people with Asperger’s tend to focus on factually based information. They shy away from emotional experiences and instead deal with others in a concrete, factual manner. The world of emotions is difficult to comprehend. For someone with Asperger’s, describing emotions, either of their own or others, is often garbled and lacking cohesion, and focused on the most factual and obvious meanings of that emotion. Grandin, who herself is autistic, describes her mind as like a CD-ROM disc. Lacking innate knowledge of feelings, she has to “compute” what she and others feel based on behavior and how it approximates feeling states. In essence, she guesses emotions. At times her guess is close to what the emotion is like and at other times it is not. In this way, like so many on the autistic spectrum, including those with Asperger’s, her thinking tends to be concrete, factual and literal. The nuances of feelings and emotions are narrow, at times absent. Thinking is likewise restricted and constrained. As I have described in this article and the preceding one, people with Asperger’s tend to think more literally than figuratively. Sensory qualities like sound, touch, smell, and appearances often shape the way they perceive and consider information. Taking notice of other people and outside events involves a shifting back and forth from their own internal experiences to what they experience outside of them. 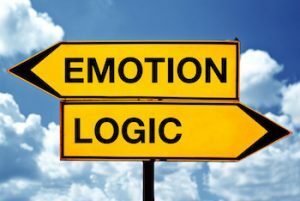 And considering the emotional states of other people as well as their own is difficult, leading to a characteristic focus on facts and information rather than subtle meanings. Understanding these characteristic ways of thinking can help those with Asperger’s appreciate how they comprehend the world and help others understand, and appreciate, the thinking that is typical of Asperger’s.